Finra member firms should declare any activity related to digital assets like cryptocurrencies, according to a regulatory notice from the industry’s self-regulator. Finra “encourages” firms to notify it about any activity at the firm level — and by its associated persons or affiliates — related to cryptocurrencies or other virtual coins and tokens, including any existing activity as well as anything planned, the regulator says. 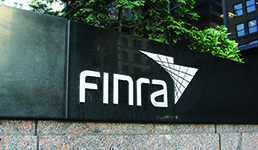 Activities to declare include trading in digital assets, derivatives tied to such assets and pooled funds that invest in such assets, according to Finra. Other activities covered include advice services to such pooled funds, participation in initial or secondary offerings of digital assets, running a platform for secondary trading of digital assets, cryptocurrency mining, accepting cryptocurrencies for payment and more, the regulator says. Finra also recommends member firms keep the self-regulator abreast of any changes to ongoing or planned activities related to digital assets until July 31, 2019. The goal of the regulatory notice is apparently to address investor protection concerns in assets that are increasingly attractive to retail investors, according to the regulator. Can the SEC Even Keep Up with the Firms It Regulates? ESG Investing and Fixed Income: The Next New Normal?